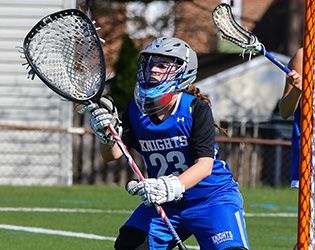 At home on Saturday, the varsity girls' lacrosse team garnered its first shutout win in the history of the program, defeating Bishop Ahr 15-0. Katherine Lioudis '18 made six saves on goal to secure the shutout. On offense, Ava Diggins '18 led the scoring with five goals, followed by Mikaela Gegelys '17 and Andree Aloise '19, who each contributed three. Rounding out the scoring were Amanda Weiss '18 with two, Emma Dean '17 with one, and defender Jennifer Lowe '17 who scored her first goal of the season. Reflecting on the game, head coach Janet Holdsworth offered, "It was a true team effort. We had no subs, just eleven players and a goalie. Among the eleven players on the field, six contributed goals." She adds, "Bishop Ahr was well-coached and the team played hard. Once we took an early lead, we were able to use some time to develop strategies for our defensive and attack systems and manage the clock." Holdsworth is also quick to point out that the work of assistant coach Chrissy Baffuto has been critical to the team's growing success: "She is an All-American NCAA goalie, and she has done a tremendous job training and mentoring our goalies. I am so pleased that she has been able to work with the girls this season."